11 generating units at six plant sites generated more than 56 percent of electricity for Duke Energy's customers in the Carolinas. Nuclear fleet continues to provide carbon-free electricity, avoiding release of 82 million metric tons of carbon dioxide in 2017 – as much carbon dioxide as released from more than 17 million passenger cars. CHARLOTTE, N.C. -- Duke Energy’s 11 nuclear generating units posted strong operating performance in 2017, providing the Carolinas with nearly 90 billion kilowatt-hours of carbon-free electricity – enough to power more than 7 million homes. “Much of our 2017 success is due to our focus on safety and work efficiencies identified by our nuclear employees, along with ongoing emphasis on planning and executing refueling outages to increase our fleet’s availability for producing electricity,” said Preston Gillespie, Duke Energy chief nuclear officer. The 11 units achieved a combined capacity factor of 95.64 percent, second only to the fleet’s 2016 record of 95.72 percent, marking the 19th consecutive year of attaining a 90-plus percent capacity factor (a measure of reliability). The two units at Catawba Nuclear Station produced more than 19 billion kilowatt-hours of electricity, and the single unit at Harris Nuclear Plant generated more than 8 billion kilowatt-hours, both setting 12-month records. Brunswick Nuclear Plant unit 2 achieved a record operating run. Both McGuire Nuclear Station units completed their shortest refueling outages ever and unit 1 recorded its longest operating run. 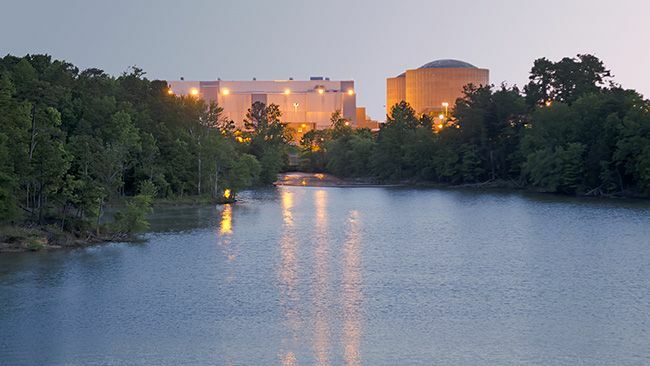 Oconee Nuclear Station unit 2 achieved a fleet record operating run. The Robinson Nuclear Plant team completed the station’s 30th refueling outage, which included a main generator stator replacement, well ahead of schedule.